Myron is a detective third grader, and Hajrah is his partner. 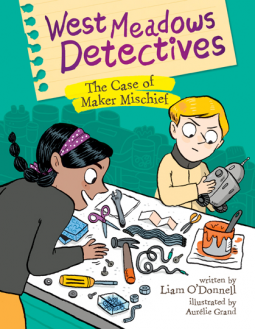 In this second book in the series they are trying to find out who stole Robson, a robot built by their classmates, Jordan and "Glitch", for the Maker Faire Robot Maze Challenge. So far this sounds like an good mystery like many other mysteries for this age range. So, what makes this book different? The West Meadows Detectives series is told in first person by Myron, who happens to be in the autistic spectrum. The reader will notice from the very first pages how this is mirrored in the writing style, which is focused in the facts, without unnecessary descriptions, or needless extra words. Myron also express in many opportunities along the story how he feels about the situations in his everyday life, like noisy places, unexpected changes in the routine, or how sometimes his brain feels overloaded by the world around him. And at the same time how much he loves logic facts, and his ability to find and process clues. At the same time Hajrah happens to be hyper-energetic, with difficulties to sit or stay still, but also a great sense of how to help Myron when he feels overwhelmed by a situation. And Myron and Hajrah are not the only ones, since they are part of a neuro diverse group at the West Meadows School. The readers will also meet Sarah "Smasher" McGintley, who is a female bully bulling boys, something also uncommon to find in children's novels. These nontraditional characters already make the story more than worthy. Now add a pinch of science, robots, coding, and challenges. Serve with black & white enjoyable pictures, that also complement the story showing the characters' body language and actions. And there you are. A wonderful book I recommend you to try. I will keep a close eye on this series myself.